On Wednesday 7th November, Mal VK8MT gave an insightful presentation on some of the projects he has been working on recently (and not so recently). Mal’s main interest is Allstar which is a radio linking system. It is based on a Linux VoIP PBX. The hardware is now based on the Raspberry Pi 2 or 3, these cost around $60 to $70. The addition of a USB Sound device ($5.00 each) and a few resistors, a diode, a FET and a link radio, and that’s about it. The software is free and available from hamvoip.org. Linking can be initiated via DTMF or a web interface that monitors and controls the node. The system can also accept and make Echolink connection. Mal’s tablet was handed around so members could see the node’s web site, which included a bubble map of connected nodes. Mal has a node setup in Rapid Creek on 439.125Mhz and indicated that it is accessible from the Nightcliff foreshore area. This node in generally connected into the VK6 network. You can also setup a radio-less node, which Mal demonstrated. This consisted of a Pi3 and a Bluetooth speaker that was gutted and then modifies with the addition of a USB sound device, a single transistor mic preamp and a LM380 amp to drive the speakers. This was connected to the internet via WiFi to Mal’s phone which was running as an Access Point. A brief contact was made to VK6LB (Peter) in Vic Park (Perth area). There was also a Beagle Xm with a LOX interface board on display, this was Mal’s first Allstar setup. The total cost of this unit was around the $300 mark. So, the price of hardware has dropped dramatically. The next project on display was a MMDVM Jumbo Spot, (which is about the size of a packet of matches). This was powered by a 5v USB Battery pack. This device was setup for the Yaesu Fusion mode but as explained the unit can operate in one or all of four modes, Fusion, D-Star (Icom), DMR and P25. There is also the ability to go into the system in one mode and come up in another. 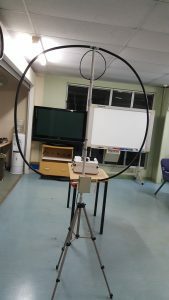 Mal explained that there are also multimode ‘Rooms’ which you can connect to which allow QSOs to take place across all modes. This system was demonstrated by linking into an echo server as there was no response to a CQ call made. This device has a very small display that shows its current operating mode and state (RX, TX etc…). This unit is based on a Raspberry Zero (WiFi), with a 70cm 10mW transceiver mounted on top of the Pi and then the display sitting on top of that, all neatly housed in a purpose-built case. These units sell for around the $120 mark on eBay. Again, the software is free and available from pistar.uk. As with the Allstar setup the MMDVM also has a web interface (or Dashboard) which is used for configuration and monitoring. These units can be setup to scan all four modes (or any combination thereof) and will stop scanning when activity is heard either via the link or a local transmission. The Spot will then stay on the current mode for 20 seconds (configurable) before resuming its scanning. These Spots are great for the traveller, as if you have mobile coverage, you can have a valid connection to the AR world. Realising that not everyone is interested in the VHF/UHF world of linking via the net (be it FM or Digital Voice), Mal shared some other small and cheap projects. The first of which was a WSPR Controller. This uses an Arduino Nano ($5) and a GPS module ($20) it produces the audio tones and controls the timing along with setting the Maidenhead Grid information. It also has an output to control the PPT. Again, the code and construction notes for this project is freely available on the net. There is much work that goes into writing the code for all the projects mentioned and it is great that these people (and in some cased teams of people) make it freely available. For the WSPR code see the W3PM Project Page. 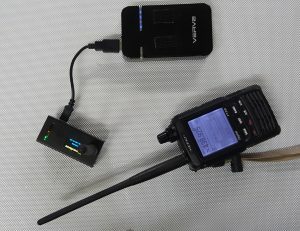 Scroll down to the heading ‘A Simple Mobile/Portable WSPR Beacon Controller’. There is also an option of adding a two-line LCD display. Switching tack yet again, Mal show us a Pi (Pi B) based ADS-B receiver that uses an RTL-SDR dongle. Again, the software is free, but you do feed the data back into the system so the supplier of the software does benefit from your data. The provider of this service is FlightAware and the PiAware software and setup guide is available from them. To rap things up Mal showed us his portable Mag-Loop. Its construction is from a length of LDF4-50, some conduit an old variable capacitor, a model plan servo and an Arduino Nano as a means of control. 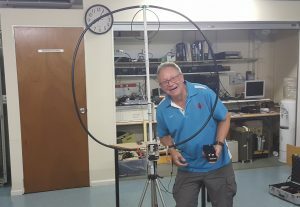 This Loop covers the 40m to 10m bands but can only handle about 10W so QRP only! It was mounted on a cheap tripod. The inspiration from this project came from Dan’s YO3GGX Project Page. Again, Mal stated that there is a lot of good information out there in the big Interweb! QSX Kit Transceiver currently being designed by Hans G0UPL. Mal agreed with Phil (VK8VWA) that this would be a great construction project for club members!